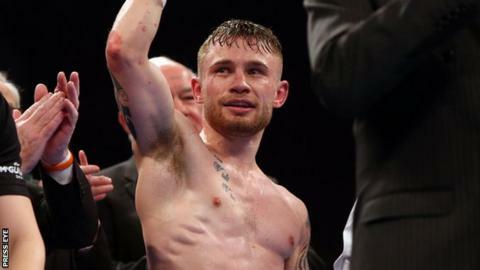 Carl Frampton hopes to secure a series of major fights on the back of an agreement reached between his team and leading American adviser Al Haymon. Cyclone Promotions said Frampton will still be managed by ex-world champion Barry McGuigan rather than Haymon, who also advises Floyd Mayweather. "I am very happy to have signed with Al Haymon," said Belfast's IBF super-bantamweight champion. "He has been the catalyst to securing the biggest fights in recent years." Frampton, who has won all 20 of his professional fights, added: "This is an exciting stage of my career after winning my world title. My team and I know this relationship with Al Haymon will help take my career to the next level. "He has a formidable reputation and I am looking forward to it." Haymon currently works with a number of leading boxers including Mayweather, Britain's Amir Khan, Adonis Stevenson, Adrien Broner, Robert Guerrero. "Al Haymon is the best at what he does, there is no question about this," said McGuigan. "Al works with many world-class fighters in the super-bantamweight and featherweight divisions, so there will be plenty of attractive fights for Carl in the coming years. "Carl is moving towards the peak of his career and we believe this is the perfect time to strike up this partnership," he added. Frampton stopped Californian Chris Avalos to retain his IBF belt in March and news of his second defence is expected soon. McGuigan indicated last month that a possible fight with Bury's Scott Quigg, who holds a portion of the WBA title, was not on the cards in the immediate future.